“Love” in our world is just a feeling of attraction to something that fulfills you. True love is when you fulfill the desires of another as if they are your own. “Love” in our world is when something awakens a feeling in me that I might get pleasure from it. I then aspire to this thing, to this spark of light. 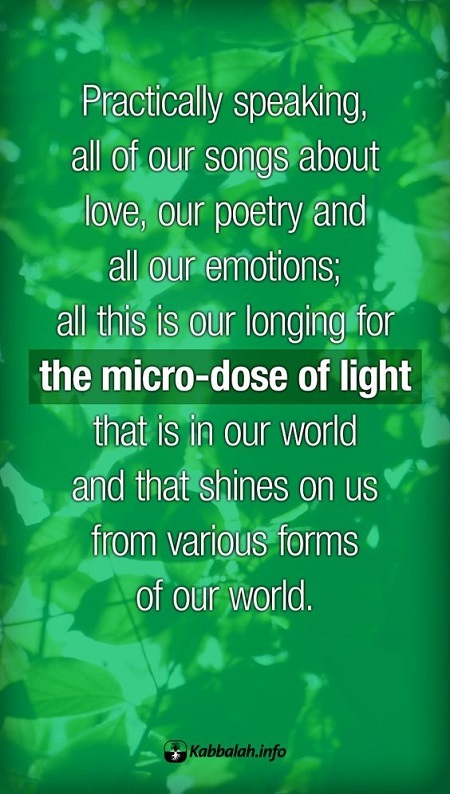 I want to get closer to this light and connect to it, so it will fulfill me. “Love for your neighbor” does not mean that you like someone’s face, personality, or status. It is when you work with and fulfill his desire. This means that you love your neighbor rather than yourself. The “Big Bang” is the result of a tiny spark of Upper Light that infiltrated our world and caused our whole universe. And it was merely a tiny spark! We need to understand that spiritual revelation is something infinitely stupendous, and we need to prepare our empty desires for it. Even the smallest pleasure which we receive upon ascending to the first spiritual degree out of 125 is billions of times greater than all the pleasures of our world combined. A great inner work awaits us, and yet it is incredibly easy only if we do it together with love. This union determines everything! 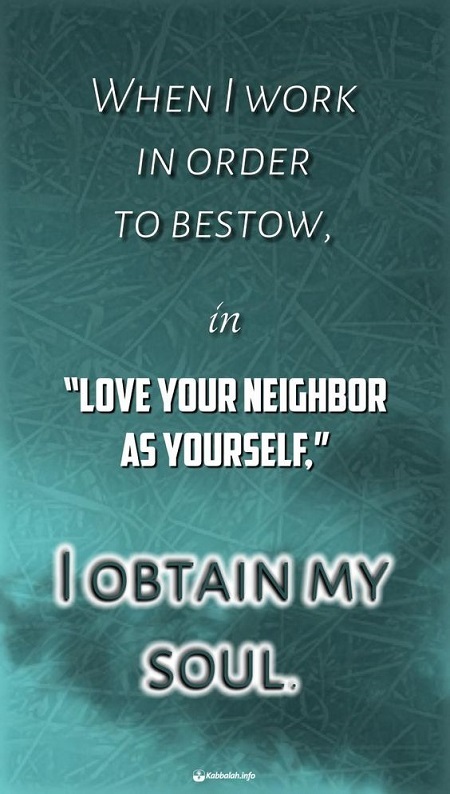 When I work in order to bestow, in “love your neighbor as yourself,” I obtain my soul. “Love thy neighbor” means connecting with your friend into one single integral system. A system of full mutual connection envelops all of humanity in intelligence and thought, in heart and desire. All of us together are a single system; we are connected between us, and we are already beginning to discover our full dependence on each other. It is up to us to help each other enter into the general system as rapidly as possible and to begin to connect it together. Then we will begin to feel not only where the contact and connection with each of the others is, but we will also feel the higher, eternal life that flows through this integral system. 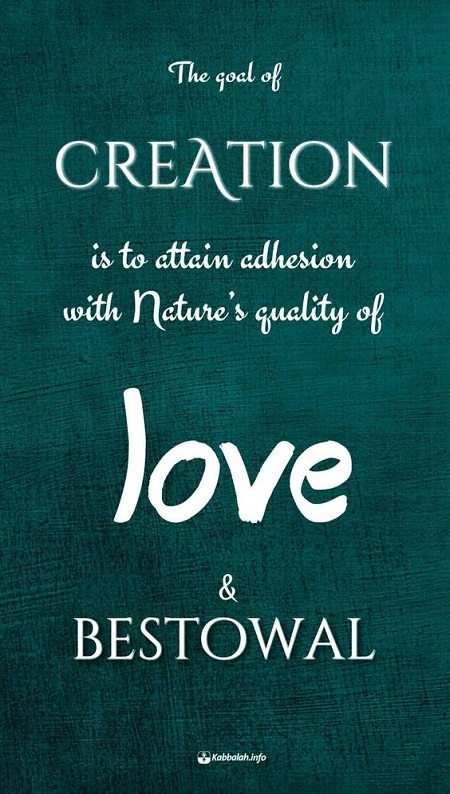 The goal of creation is to attain adhesion with Nature’s quality of love and bestowal. The goal is adhesion to the Creator. Love is the means. The pleasure is in becoming like the Creator. Adhesion is attained through my bestowal to Him and His bestowal to me. In order for us to have a connection with mutual reception and bestowal, we need love for one another. It is said: “A husband and a wife, and the Divine presence between them”. 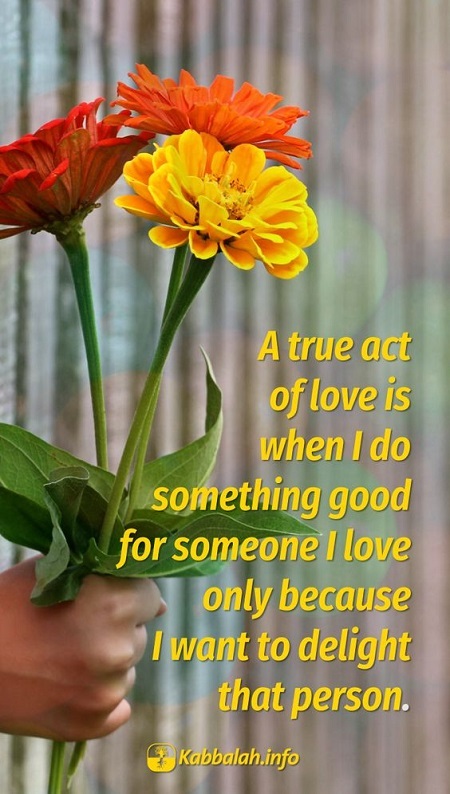 If a husband and a wife start cultivating a relationship of absolute giving, this connection is born, this triple union is formed between them. Instead of our merely tolerating each other, we join together as one whole! This is called: “A man and a wife and Divinity between them.” We begin to relate to each other through the Creator since we are not alone: He always is between us. That’s why I perceive my wife through the prism of the Creator, that is, I see both the Creator and her. Accordingly, she sees the Creator and me. If we don’t take into account the third factor we won’t be able to build a triangle, nor will we be able to live together.